Sometimes you read a collection of clever stories & you think that yes, over a period of years, writers can come up with a few good ideas. 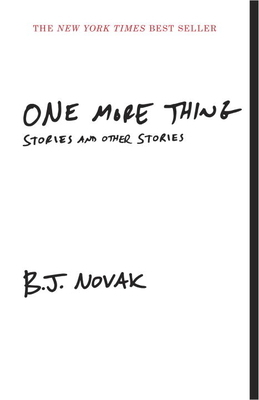 It would take many lifetimes for even the best of writers to come up with the fantastically warped tales that BJ Novak has put together here. I'm used to being the most clever guy in the room, but I have yet to share a space with BJ. I'm sure that when we do meet that we'll become the best of friends. Totally worth reading this book! B.J. Novak is perhaps best known for his work as a writer, actor, director, and executive producer on NBC’s Emmy Award-winning comedy series The Office. He is also known for his stand up comedy performances and his roles in motion pictures such as Quentin Tarantino’s Inglourious Basterds and Disney’s Saving Mr. Banks. He is the author of The Book With No Pictures, a #1 New York Times Bestseller, and his stories have been published in The New Yorker and featured on This American Life.